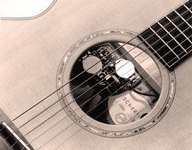 This pickup is designed to give a truly authentic acoustic guitar sound. Unlike most other magnetic pickups which give an electric guitar sound, the SH 145 Prestige gives a crisp natural acoustic sound. It is built as a stacked humbucker using powerful samarium cobalt magnets. 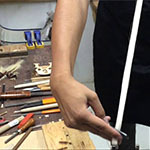 Adjustable pole pieces are trimmed to provide a perfect string balance for the acoustic guitar strings. 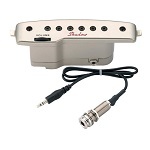 As it is a humbucker, it is free of 50/60Hz hum. A complete shielded case and low impedance output protect it from outside magnetic disturbances and makes it totally hum-free. Electronic circuitry is powered by a single 3V cell battery with an extremely low power consumption. 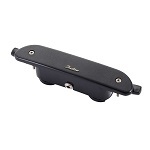 Volume control and easy installation make this award-winning pickup one of the user-friendliest pickups on the market. 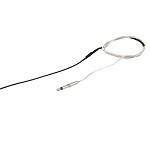 An endpin connection cable for permanent installation and a detachable quick mount 12’ (4m) cable are included. This pickup has received in the shortest time the most favorable test reviews in music magazines worldwide. Also available in black satin (SH 145-B). The active single coil pickup is characterized by perfectly balanced output and creates, unlike other magnetic sound-hole pickups, a very clear and crisp acoustic sound. 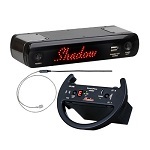 Low impedance output and a completely shielded case makes the SH 141 totally hum-free. The installation is as easy and it can be and done in seconds. The SH 141 comes with a stereo endpin connection for permanent, "internal" installation. Additionally, a detachable quick mount 12’ (4m) cable for temporary, "external" installation is included. Electronic circuitry is powered by two 3V cell batteries (#2032) with an extremely low power consumption. 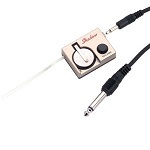 The SH PFC-W is a wireless system included with the new Panaflex (=Stereo Nanoflex) pickup. Only small modifications (pickup under the bridge only) are neccessary on the guitar. With special tapes you can mount the transmitter in all typical classic soundholes from 82mm to 90mm diameter. The panorama control adjust the width of the stereo impression. You can add re verb effects to the treble strings where the bass strings are without effects. Secondary you can control the sound with a combined bass/treble control (B/T) for the treble AND the bass strings. The last control is to adjust the volume. Of course you need a receiver to operate. On older analog wireless system it was more complex to choose and select a desired transmitting channel. Not here: With an easy push of the pairing button on transmitter and receiver both are "paired". With this easy method you can operate more than one transmitter at a time on the Shadow wireless receiver. The receiver is powered by a simple USB power supply, well known as you probably already have for your cell phone. On the top of the transmitter is the location of the USB charge jack. You can connect the USB power supply to charge the internal LI-ION battery. Or you can use a cable between the front output of the receiver and the charge USB jack of the transmitter. All you need is to connect a USB cable "Type A to Micro A". On the back of the receiver there are two outputs. One for the Mono/Stereo analog output and one for an optical digital S/PDIF output. The S/PDIF output can be used for other digital optical sound system e.g. your recording sound card or your computer. The S/PDIF output is best for recording because it delivers pure output of the stereo pickup. We built in a perfected digital transmission system which is able to transmit 2 channels simultaneously. There is no lost in sound quality during transmission. The range is around 80m and this should be enough for huge stages as well. The integrated LI-ION battery has a capacity of 1100mA/h. This is good for an operation up to 5h. with one charge. The integrated charging system allows to connect modern cell phone power supplies with the ne mcior USB connector. After a charging time of 3-4h the capacity of the battery back to ~ 80% of the overall capacity. The battery (NP120) is a very common type which can be get for small money in almost every camera/camcorder accessory shop. Push the tuner switch to operate the tuner. There are two modes. One with active wireless transmission the other without. This will save the battery. The 7-segment display shows the played note. The Leds HI and Lo indicates if the string tune is to high or too low. When the middle Led OK is on, the string is tuned. Stereo Sound delivered by the new Stereo-Panaflex? Pickup. Leight weight LI-ION battery. Up to 5h playing with one charge. Only small modifications necessary on your guitar! Automatic frequency-hopping-system for perfect wireless operation.